Meet Taufik, a seven-year-old deaf and mute boy from Senaru village in North Lombok. This unassuming child is now hailed as a hero for his act of helping foreign tourists evacuate from the area when an earthquake jolted Lombok Island recently. The boy, who lives with his grandmother, earns a living by acting as a guide assisting tourists and visitors at the Tiu Kelep and Sendang Gila waterfalls in Lombok. He assisted Malaysian tourists to find a route out of Tiu Kelep Waterfall, when a 5.4-magnitude earthquake occurred and triggered landslides on March 17. “If not for him, I and six others would have sustained serious injuries that could have been tragic, more (of us) could have shared the fate of our two Malaysian friends who were killed in the catastrophe. “Taufik was the first to rush towards me and a few others to help us at the exit when the quake occurred while his older cousin Tomy Al Bayan ran towards the others in our group who were having a dip. “My friends and I followed Taufik towards the exit, while Tomy was still in the waterfall area when the second quake occurred. Taufik had turned to see a huge rock hitting Tomy and my two friend. 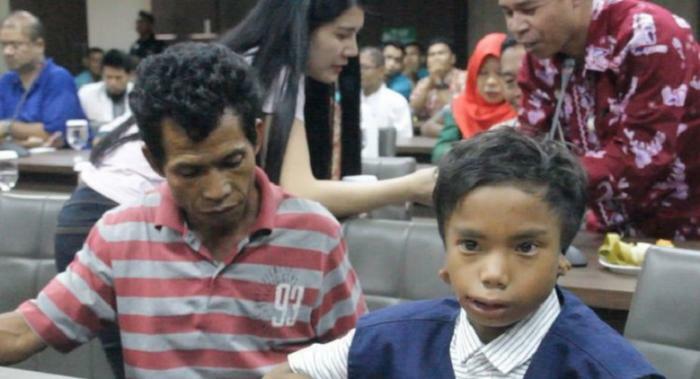 There are now plans to bring Taufik to Malaysia, and GPM wants to provide him with any medical care he needs. Well done Taufik. You are indeed a hero.